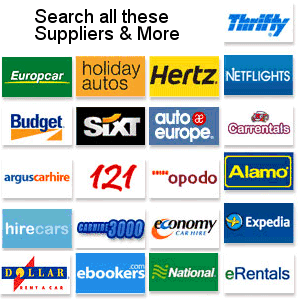 For cheap car hire simply complete the search form above and click the "Search Now" button and we'll return you all the very latest car hire prices from up to 50 companies. Then click on the deal that's best for you and you'll be taken straight to a booking form where you can find the full details of your rental car and have the option to book online or by phone. Since 2003 Carrentals.co.uk has been comparing the car hire market to find the cheapest prices. In 2008 Carrentals.co.uk was voted Best Car Hire Website at the Travolution Awards. Carrentals believe they have the best car hire comparison site on the internet and with over 650,000 rentals to date, we continue to innovate and improve. They now compare even more car hire brands than ever before, such as Europcar, Hertz, Avis, Thrifty, Sixt, Alamo, and Carhire3000. Plus they've added dozens more specialist brokers to give you the very best prices and widest choice of car hire suppliers.